I am a huge fan of Romance and Love, matter of fact I have devoted an entire series to Romance. I have many paintings about this amazing subject. I have at least fifteen works devoted to my husband and best friend. My Romance Series is available as small prints and art cards, all of the Romance series originals are sold except for my newest Romance painting The Moonlit Chat III above. If you wish to see more of my Romance Series please check out my website www.artrushgallery.com. my best friend because it helps us to re-connect over and over again. 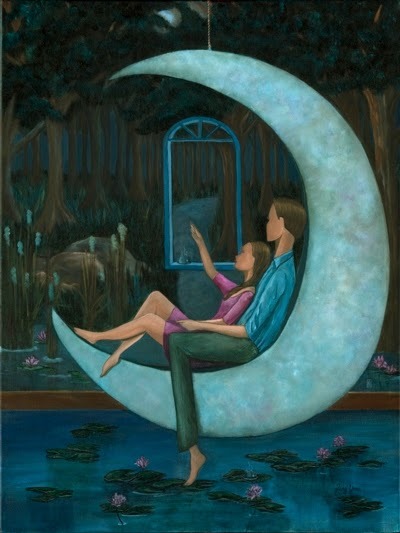 This painting is created for the romantic at heart because I am one too. 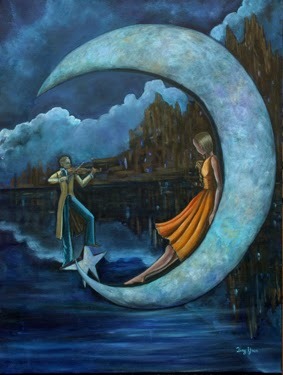 Moonlit Serenade is about the importance of romance. My husband and I have been together for twenty years, we have had our challenges and have worked through them and became stronger as a couple. One of the things that nurtures the strength of our relationship is doing special things for each other on a daily basis, this reminds us how much we appreciate each other and makes us come together as a loving couple. Happy Valentine's Day everyone! Remember your loved ones and treat them to something thoughtful and special.